Truly—with fraud on the rise, gone are the days of traveler's checks. Using ATMs for money transactions while abroad is now the most popular choice for travelers headed to developed nations. And in Greece, ATMs are prevalent and convenient. They can be found street-side, as well as in banks, hotel lobbies, restaurants, and tavernas. In most cases, using an ATM costs little more than your usual bank fees, though this varies depending on your bank's policy. And generally, you get the best available exchange rate directly from an ATM, as well. If you are traveling in the Greece countryside or to small towns, locating an ATM may be difficult. However, major credit cards like Visa, MasterCard, and American Express all have ATM locators on their websites. You can use this service to plan your route should you need money while on the go. Or better yet, withdraw your money at an ATM in a larger city before heading out to rural areas or reaching your final destination. In cities and large towns, many Greek banks house their ATMs in glass-enclosed rooms just outside the bank itself. The door will be locked, but an ATM card (from your home country) will open the lock. Just slide it through the card reader and enter. Most ATMs in Greece will accept debit cards issued by a common credit card company like MasterCard or Visa, but almost always they will require a four-digit PIN number for verification. If your PIN number is longer than four-digits (or contains letters), make sure to change it to a four-digit number before you go. This is also a good time to alert your bank that you will be traveling abroad so that your withdrawals don't look suspect, resulting in a blocked card. Make sure to tell your bank where you will be traveling to and how long you will be gone. If you are using an ATM that charges a per transaction fee, you may be tempted to withdraw a large amount of money in one shot. There are a few things to consider before doing so. First, contact your bank ahead of time to familiarize yourself with their policy on withdrawal limits and the potential of raising yours while traveling. Next, be sure to have a safe place to store the money you withdraw, like a hotel safe. If one is unavailable to you or if you'll be constantly on the go, paying the low fees charged for each ATM transactions to keep your money safe is worth it. At busy tourist locations, it's very common for ATM machines to run out of money on weekends. If this happens, they usually stay empty until mid-week. 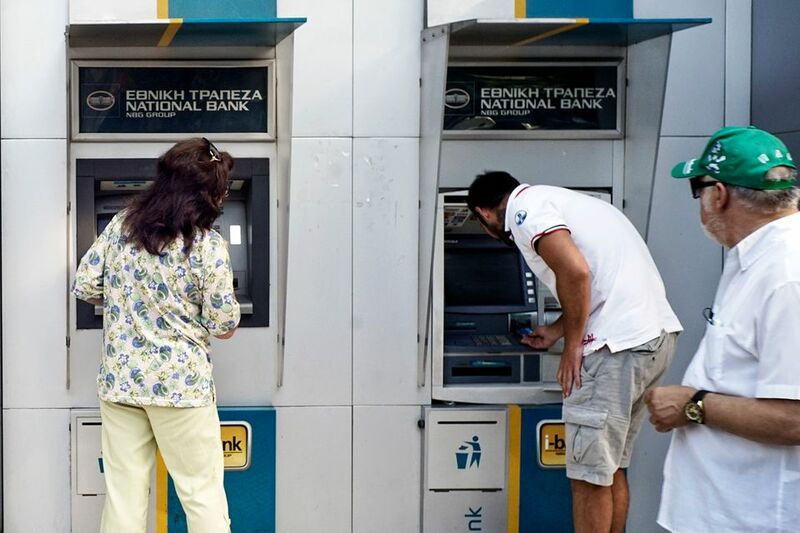 Greek ATMs with signs displayed in English or other languages generally run out of money first, whereas machines—even 10 feet away from the empty ones—without translated signs may still contain Euros. Usually, once you put your card in one of these machines, the display will—most likely, but not always—come up in English. Also, during times of financial uncertainty (which can happen due to Greece's historically depressed economy), ATMs may not be refilled on schedule. Coinciding bank mergers also can reduce the number of ATMs available in some places in Greece, as previous competitors merge. Always have enough emergency cash for a few days. And avoid getting low on money so that this will not be a problem. To avoid possible theft, plan ahead so that you aren't using ATMs in the middle of the night. While incidents are rare, this is a good policy to follow in any country.